Click on any category below or scroll for answers. If you haven’t found an answer in our resources, and still need help, please contact us. How do I sign up on Maroon Oak as a Member(Free)? Registration is easy! All you need is a valid email ID. Step 1: Click on Login/ Register on the top right in the main menu and click on Register. Step 2: Add your username, email ID and an 8 character password (Your password should include 1 uppercase letter, 1 lowercase letter and 1 number). Step 3: Once you Create your Account, we will send an Activation/Confirmation message to the email account you used (image below). This is done to protect your email account from being misused. (This email might take upto 5 minutes & do check your junk folder). Step 4: In your email, click on the confirmation link to activate your account. This is an important step to protect from email ID from misuse. Login with the User id and Password. If you’ve already registered, Login using the menu at the top of your screen. We send you the email as soon as you sign up. But sometimes the email servers take time so we suggest waiting for 10 minutes. Do check your junk folder too. Still don’t see the email? Then write to us at Info@MaroonOak.com from the email ID you used to register (so we can verify your email in our system) and we will activate your account for you. 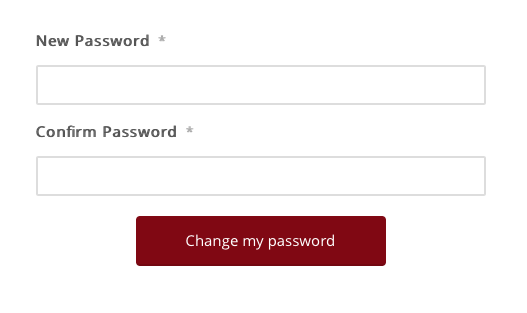 Step 1: On the Login page, click on the Forgot your Password? link. When you see the image below, enter your email info to receive the Password Reset Link. Step 2: Check the Inbox of the email you used to Register for Maroon Oak, to find the Password Reset Link. (Note: You might need to wait for a few minutes to get this. Also, don’t forget to check the Junk Folder.). Click the Reset your password button in the email (image below). The same password rules apply for a reset (8 or more characters, at least 1 uppercase, I lowercase, 1 number). Why am I not able to save my profile? Your Membership Profile has a few mandatory fields like Industry, Skill Types etc. Each mandatory field is marked with a ‘*’ (star symbol). Unless you fill in all these fields, your form will not be saved. How do I sign up on Maroon Oak as a Pro Member (Paid)? Our step by step process (image below) will guide you to sign up as a Pro Member. 1. Select your Pricing Plan. 2. Register by filling in your info. If you are upgrading your Membership, you only need to log in and enter your Store Name. 4. Enter Payment details. Update a Coupon if you have one. 5. Get ready to use – go to your Pro Member Dashboard and start adding products or updating your Store Page. Step 1: In the main menu, Click on your name, and then Member Profile to view your Profile. The Profile will be have only your name until you update and add info. Step 2: Click on the gear icon to the right, under the cover image field to edit your profile. For a robust profile, add a profile photo and personalize your cover picture. In each field, hover your mouse on the ‘? ‘ to read help text. Step 3: The fields marked with a ‘*’ are mandatory, and your form will not save until you fill all of them. Also, add a Profile Picture and Cover Picture. Step 4: Once you have filled your profile, save it by either clicking the gray check mark on the right under the cover image or the Update profile button at the bottom of your profile. If your Form isn’t saving, check if you have left out a * field. How do I maximize my profile? Complete profiles not only get you views and connects but also a chance to be featured in our member promotions. The more details and images that you add, the better your profile looks! Share your Skills – 1, 5 or as many that apply! Don’t forget your Website and Social Links. In the question ‘looking for’ – talk about your goals. Do you want to grow your business, find more gigs, looking for referrals. Be as specific and detailed as you like. Want to collaborate with another business owner? Add the skills you’re looking for and you will automatically be added to our Opportunities Listing. Know members or worked with any of them? Don’t forget to ask for a review. How do I upgrade to a Pro Membership? On your Profile (and Pages on the Platform) click on the Upgrade membership option to opt for the Pro Plan. Please note that if you need to be a Member and not signed in first. How do I list my product(s)? Step 1: On the main Menu, click on the Pro Member Dashboard to access your Store soon. Click on Products, and Add New and populate with details and features. Step 2: On the Add Product screen, you can update the various features, including an image, URL, Price, Sale Price as well as Description and Categories. The more details you share, the better is your product’ visibility. Can I delete/ change my products? In your Dashboard, click on products to view Products already listed. You can then edit or delete products and re-save them. How do I add my products to the marketplace? How do I create my shop page? What are the methods of payment? or how do I pay? Right now, you can pay via PayPal or using a Credit or Debit Card if you don’t have a PayPal account. In both cases, the payments are processed via PayPal and any payment info is stored with them. How do I make changes to my account like name, password, notifications and privacy settings? How do I make a payment for pro-membership? How can I add/ change my credit card on file? Can i get a refund for my Pro-Membership payment? How can I get in touch with Maroon Oak? We love to hear from our Members, Readers, Authors, Visitors and Subscribers. If you have questions, concerns, feedback, just email us or send us an Instant Message (find the chat window at the bottom right on every Page). Or connect with us on Social. Here are different ways you can contact us. A guide for new users. A Business & Career Networking platform for WOMEN, Maroon Oak is the place for connections, visibility and growth. With a robust marketplace of curated digital tools and freebies, a highly rated blog and learning webinars, videos and other resources, we are the place where #WomeninCareers not only forge connections and collaborations, but also find answers to their entrepreneurial and work-life challenges. How does Maroon Oak work? As a Maroon Oak visitor, you will have access to all our business and career resources – Marketplace and Blog. As a Member, you can create your free business listing and connect and collaborate with other entrepreneurs. As a pro-member, you can additionally share your digital downloads in our market place. What does Maroon Oak cost? Maroon Oak membership and business listing is free for #WomeninCareers. There are two paid plans for Pro Membership. Who can benefit from Maroon Oak or who does Maroon Oak serve? Maroon Oak is for all #WomeninCareers who want to grow their skills, network and business. Who should become a Member on Maroon Oak? If you are a woman with a Business or Career- Entrepreneurs, Business Owners, Professionals, Mompreneurs, Part timers, Re-Launchers and Multi-Potentialite, you should be a part of Maroon Oak. Who should become a Pro Member/ Vendor on Maroon Oak? If you are a business with digital tools, freebies, lead magnets, opt-ins, courses, facebook groups etc, then you can list any of those tools for maximum exposure, traffic and leads on Maroon Oak. How can I use Maroon Oak without signing up? Maroon Oak offers myriad resources. You can read our blog and browse and get access to our marketplace as a customer for free. However, in order to list your business or connect with other member entrepreneurs, you will need to become a member. How do I find the digital resource that I need? Our marketplace is constantly adding tools to suit every budget and level of expertise. We offer digital downloads in more than x categories and over x sub categories( i.e Tags). To find a digital tool, go to our main marketplace from the top menu. use the filters to sort by Tool category, cost (free or paid) or type ( guides, courses, ebook ). How do I save tools that I’m interested in? With our fabulous wishlist feature, you can easily create a wishlist of products that you are considering. For members, this wishlist stays even when you log out. How do I download/ buy a digital product? You do not make your purchase on Maroon Oak. Once you select your digital product, you are directed to the vendors store. Simply follow the individual vendors prompts to get access to their tool. Providing reviews is a great way to support the business who’s tool helped you and also help others find high quality tools.To leave a review…. Have you tested these tools? We spend a lot of time curating resources to make this a one-stop marketplace for all your entrepreneurial challenges. Unfortunately, testing each product is not really possible for us. Instead we rely on our audience to provide reviews on the products they have used and help make this a robust resource. How can I get visibility and business on Maroon Oak? Simple. If you want visibility and business leads, sign up to be a Member/Pro member. Who can become a Pro-member on Maroon Oak? Any women entrepreneur or professional who has business and career related digital products can list them on the Maroon Oak marketplace. How does listing a product benefit me? If you have digital products, then Maroon Oak is an additional source of visibility and business leads. The traffic comes to you and your list grows. You can read more details here. What kind of products can I list? Digital only! You can add virtual or downloadable products that users can click on, to watch, subscribe or buy. Read more here. How do customers pay for/ download my products? Customers on the Maroon Oak Marketplace are directed to your website and then follow the directions that you have set. On Maroon Oak, they have the ability to create their wishlist with digital products from diverse vendors and they can proceed to buy on their whenever they are ready. Simple sign up for a Pro membership on Maroon Oak and start adding your products right away. Will Maroon oak promote my tools? Maroon oak promotes pro-members and their tools in emails, social media posts, video promotions and ads. Pro-members with a complete profile, great tools and positive reviews have a good chance of getting featured. How can I maximize my pro-membership? How can I get reviews? Fill your profile, share relevant tools and update your information. Eg: if you make a change on your tool on your website, remember to simultaneously make that change in your listing on Maroon Oak. And encourage your fans to leave a review for you here. Can I respond to an individual review or flag it on Maroon Oak? Head to the Sign up/ login/register page, fill up your details ( name and email). Remember to Activate your account via the email link. If you’ve already registered, then log in by simple clicking the login button on the top right of the screen. How do I sign up on Maroon Oak as a Pro-Member (Paid)?